“The world hates change, yet it is the only thing that has brought progress,” noted Charles F. Kettering, an acclaimed US inventor with more than 200 patents to his name. What has brought us out of the cave into climate-controlled, well-lit homes full of high-tech equipment is the result of change, the fruit of many, many innovations that have helped mankind evolve and progress throughout history. Clearly, Kettering is right with the second part of his statement: innovation equals change. But does the world really hate change? Today, we take a brief look at human responses to change and innovation in order to understand the implications for innovators and businesses. Does the world hate change? Imagine you have two choices – significantly change your life or die. What choice do you make? When the choice is put this way, almost everyone says they would prefer to change their life. What’s interesting is that in real life, judging by their actions, a majority of people choose to die. As reported in a famous article by Alan Deutschman titled “Change or Die” that was published in the magazine Fast Company in 2005, doctors put forward two choices to patients who survived a heart bypass operation. Doctors told the lucky survivors they needed to significantly change their lifestyles. But two years after the operation, 90% of patients did not change their unhealthy living habits, often with fatal consequences. Is there any more powerful example of the inability to cope with change? No doubt about it, Kettering is right: the world hates change. We can even quantify this statement: 84% of the people in the world hate change. That number would be bad news for mankind if it were not for the remaining 16% who thrive on change. But who makes change happen? At the forefront of change are innovators, who develop and activate new products, services and solutions. All innovation depends on this 2.5% of the overall population. New innovations are first picked up by the so-called early adopters. Representing 13.5% of the overall population, these visionaries and technology enthusiasts are the first to understand the superior value proposition of a meaningful innovation. Consequently, they play a pivotal role in convincing other people to try new things. The first large adoption segment comes next: The early majority (34% of people) are those who try out a new innovation based on the positive experiences and recommendations of the early adopters. The positive experiences of the early majority motivates the more skeptical and change resistant late majority (likewise making up 34% of the overall population) to also adopt the innovation. 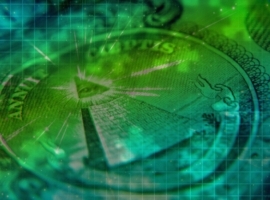 At the end, the laggards account for the remaining balance of 16%. Many months or even years after the initial launch of a disruptive innovation, the naysayers and sceptics are finally convinced to join the bandwagon. However, by then the innovators and early adopters have already moved on and created and propagated “the next big thing”. In his book of the same title, marketer Geoffrey A. Moore asserts that only once a disruptive innovation is able to build enough momentum to Crossing the Chasm between early adopters and the pragmatic early majority, will it become a major success, leading to an initially exponential rise in sales and boost in profits. What does the adoption theory mean for innovation? 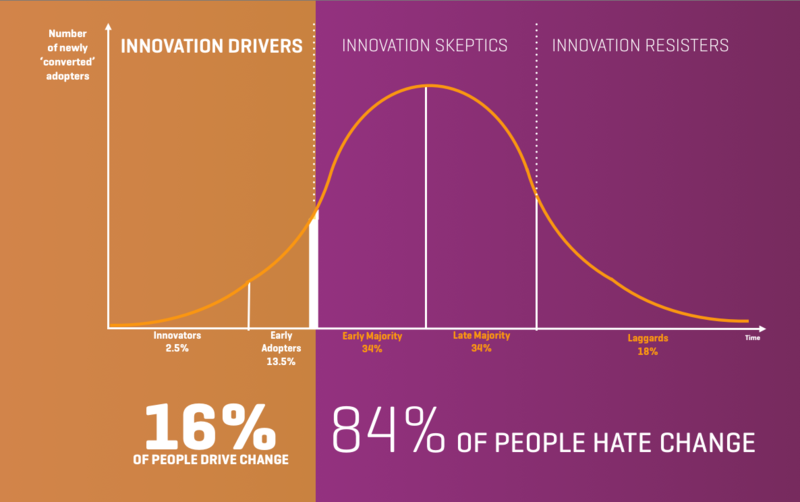 First of all, the innovation adoption curve suggests that only one in forty people is a born innovator. For a company that aims to become an innovation leader, it’s crucial to identify these idea people in its own workforce and to attract outside innovation talent to join the firm. Given the freedom and resources they need to perform well, these innovators will create innovation and make positive change happen. Secondly, companies need to identify and cherish those one in eight customers who are early adopters. Often, these are risk-tolerant, open and extroverted people with huge networks who are enthusiastic about new technologies, products and experiences. In his book The Tipping Point, Malcolm Gladwell classified such early adopters who carry a new innovation into the early majority into three groups: “connectors,” representing hubs in a social network, information brokers (“mavens”), and “salesmen” who are masters at spreading the word. The progress of mankind depends on just 16% of the overall population. Who are the vital few people in your firm who make innovation happen? How will you systematically identify and attract outside innovation talent? How much do you know about the early adopters of your firm’s products, services and solutions? Who are these vital few opinion makers who help your new innovations become blockbuster successes? Isn’t it time for you to find out which of your employees and customers make innovation happen? Or are you interested in a TIPS training course for your company or work team? Contact us and let us know how we may help you. © Dr. Detlef Reis 2011. This article was originally published in parallel in a nearly identical version in the Bangkok Post on March 3 2011. Next article What kind of innovator does your business need?